It is clear that multivalent sialosides may offer numerous opportunities for ''medicinal glycobiology.'' They can be used to increase receptor binding interactions in areas such as flu virus inhibition of hemagglutination, anti-inflammatory agents (se-lectin antagonists), cancer vaccines and immunodiagnostics, and in treating gastrointestinal infections. Moreover, inasmuch as sialic acid receptor themselves might be organized as clusters, it appeared sound to synthesize multivalent glycoforms varying in molecular weights, shapes, valencies, and geometries to ''scan'' wide ranges of topographical areas. To this end, suitably functionalized V-acetylneuraminic acid derivatives were required. A convergent approach in which various sialoside haptens and other carbohydrates of interest could be attached to multivalent scaffolds at a late stage was chosen. This strategy offers the advantage of permitting further optimization of binding interactions where appropriate. 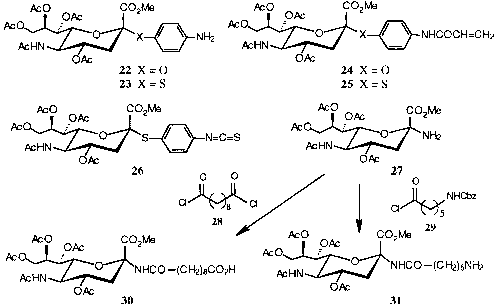 General approaches in which V-acetylneuraminic acid derivatives could be used as either electrophiles, nucleophiles, or comonomers were considered. Using derivatives already obtained through PTC (Scheme 2), it was possible to provide the necessary building blocks. Thus, thioacetate 6 was readily de-S-acetylated into potent nucleophile 7 (NaOMe, MeOH, -40°C, 30 min, 88%), which had been treated with 4-nitrobenzyl bromide (16), a wide variety of V-chloroacetamides 18, or galactosyl derivative 20 (Z. Gan, R. Roy, unpublished results) to afford key precursors 17 (74%), 19, or 21 (70%), respectively (Scheme 4). 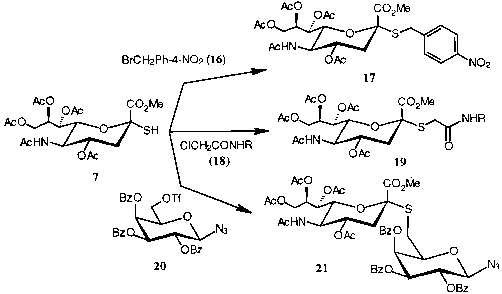 V-Chloroacetamides 18 represent typical examples of multivalent scaffolds onto which were built various V-acetyl-neuraminic acid dendrimers (see below). Multiple chloride substitutions were found to be very efficient and high yielding, together with providing a key !H NMR signal (8 4.2 ppm) that was used to evaluate coupling efficiency. chloride (28) or with Cbz-protected 6-aminocaproyl chloride 29 to give acid 30  or amine 31  after standard deprotection. Acid 30 was used in solid phase synthesis of hyperbranched dendrimers , while blockwise approach was used to transform amine 31 into oligopeptoids up to an octamer level . With efficient (active-latent) and stereospecific (PTC) methodologies in hand for key building block syntheses, the stage was ready for multivalent sialoside preparations.